GREENFIELD, MA — On the same day the Senate released its first draft of its budget, a group of experts gathered to discuss the state of local public education. 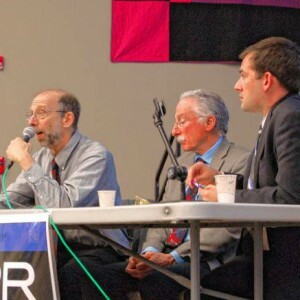 Education experts advocated both at the state and local levels for sufficient funding for rural public school districts and championed opting out of state “high-stakes testing,” at an event hosted by the Franklin County Continuing the Political Revolution and the Massachusetts Teachers Association. For a few hours Tuesday night at Greenfield Community College, experts Dave Danning, Director of Research for the MTA union, Joe Kurland, member of the Mohawk Trail Regional School Committee and Doug Selwyn, a professor of education in New York discussed with an audience of activists and community members what they believe needs to be done to advance the public education system in Franklin County and across the state. Joining the panel of experts, who all presented about specific topics, was Chris Cappucci, director of research for Rep. Paul Mark, D-Peru. He gave a legislative update, noting particular bills on the table. A major discussion of the evening focused on equal funding for students in rural districts versus urban and suburban districts. “(Mark is) there fighting for equal funding for all students in his district and across the Commonwealth as well,” Cappucci said. Kurland spoke of the tension he has seen among lower-income populations in rural and urban districts pulling for similar funding at the state level.